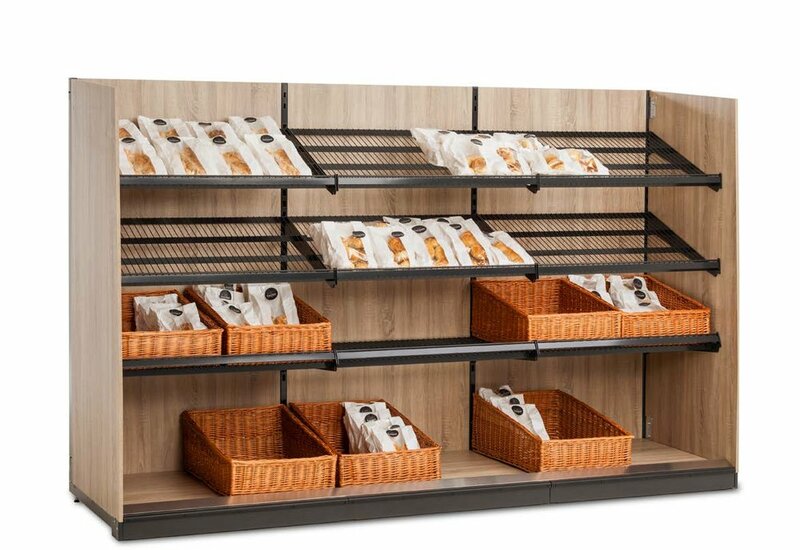 For more than 15 years, Wanzl has worked together with the food retail sector to develop sales systems that attractively display freshly baked products from bread to pastries for retail markets. To date, several hundred stores have opted for Wanzl BakeOff modules as a result of this successful collaboration. .
With the Wanzl BakeOff 2.0, baked goods presentation will be a highlight of the store. With high product density and maximised filling volume, the system is highly flexible to accommodate your spatial conditions and processes. The modular design enables a flexible response to changes in a range, with minimal assembly work. Click here for a detailed overview. With the latest generation of BakeOff 3.0, we are ensuring that your baked goods are firmly in the spotlight. Your products are clearly displayed behind hygienic covers, generating maximum sales impact. Items are filled from the front or back depending on your sales area. Click here for a detailed overview. This sales unit can be used in the store both as both a stand-alone solution or in combination with BakeOff modules. With its modular design it can be designed for any space whilst always ensuring the product is attractively displayed. Click here for a detailed overview.